With change coming to the California governor’s office after next week’s election, this year’s Women’s Conference was the last in its current incarnation for hosts Maria Shriver and Arnold Schwarzenegger. 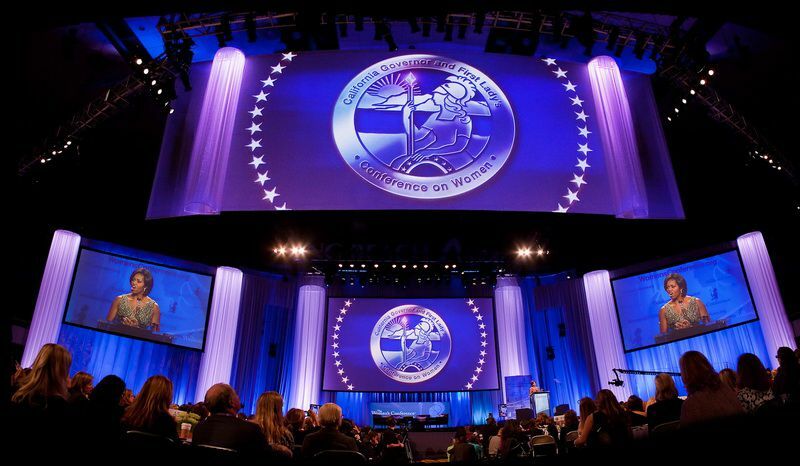 It was also the conference’s largest showing, with more than 140 top speakers and participants, including Michelle Obama, Jill Biden, Oprah Winfrey, and many more, who drew a sold-out crowd to the Long Beach Convention & Entertainment Center. In response to the high demand—tickets sold out in one hour, beating last year’s record of two—organizers grew the event to three full days, with an additional health- and wellness-focused day on Monday, and Shriver’s March on Alzheimer’s and Broadway-style show for 900 on Sunday, increasing attendee capacity by 7,000, bringing the total conference attendance to more than 30,000. Conference executive director Erin Mulcahy Stein worked with executive producers Alexandra Gleysteen, Karen Skelton at Dewey Square, and Carl Bendix at Ambrosia; Bendix handled the overall production and coordination, and has worked on events for the Schwarzenegger-Shriver family for more than 25 years. “The size and scope and scale [is appropriate to mark the] last year of the administration,” he said. “Everything has grown in size, stature, and production enormously.” The conference was in existence 17 years before the current gubernatorial administration, and Shriver hinted (to much applause) that she is considering continuing to host a women’s conference in some capacity. Obama’s presence at the morning session necessitated a strong Secret Service presence throughout the venue and surrounding areas. This meant guests were encouraged to arrive significantly before the 8 a.m. scheduled start time to navigate the security and crowds. With many guests arriving before 6:30 a.m., producers added a 45-minute preshow to entertain them.